So there’s a funny video that has been circling the Internet lately. It’s a “commercial” for skittles. If you’ve seen it, I needn’t say any more. If you haven’t, you can check it out with a quick youtube search, but keep in mind, it’s pretty NSFW and very NSF-kids. If you can’t watch it, here’s a quick summary: two humorously styled newlyweds are, eh-hem, consummating their vows in what looks like an 80s ski lodge. When the groom finishes, well…skittles start flying everywhere. The tagline “taste the rainbow” is, thusly, given new meaning. I showed it to my brother and a little argument ensued. He said this was obviously paid for by Skittles, then covered up with the disclaimer. He argued that the production quality was too high to be a Joe Schmo YouTube hit, and that it was too coincidental that the spot clocked in at exactly 30 seconds. He also noted that the specs adhered to Skittles’ current campaign pretty flawlessly, and that that campaign has grown more and more irreverent and bizarre in passing years. This spot was a natural, albeit racy, progression for the Skittles brand. My argument was this: it’s 2011. There are start-up video production houses on every corner. If you have a Canon 7D, a Mac and a fair amount of practice, you’re probably capable of producing pretty convincing high-quality video. “But what’s the incentive to advertise Skittles?” my brother asked. “Simple,” I responded. “Someone had this idea for a Skittles ad. The YouTube ad revenue, and publicity for their production house, is theirs to keep.” Additionally, while Skittles’ ads have been increasingly weird as of late, they’re still a kid’s candy for crying out loud, and this ad is more than just offbeat. It’s R-rated. Some ad men might call it risqué, but others would consider it full-on Brand Suicide. So, what do you think? In the end, the only thing my brother and I were able to agree on was that Skittles, whether secretly behind the video or not, is at least marginally enjoying its viral success. I’m sure there are lots of creepy college guys out there recreating the scene from the parody with their girlfriends for a laugh. And that means they’re buying Skittles. Hasn’t this campaign *always* been kinda surreal? There has admittedly been a lot of hype on companies making NSFW or NSFT (TV) commercials just for the publicity, web traffic and talk. I don’t honestly see Skittles as a kid candy. I see it as a lot more broad, even leaning towards adults. There’s no kiddies, cartoons or young-type advertising that I’ve noticed lately. Sure it’s colorful, but that’s just attractive. 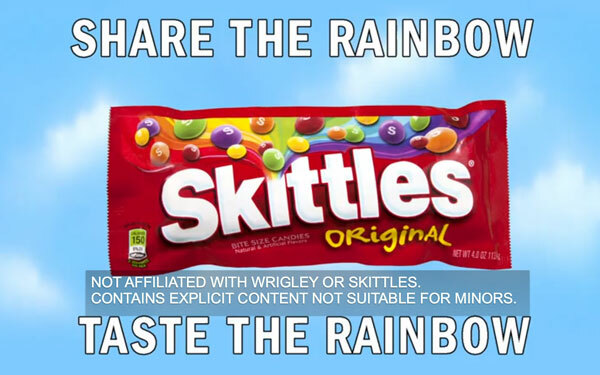 Skittles will do best to keep their mouths shut either way. I remember the outrage when someone made a fake Nintendo commercial and Nintendo hit them hard with a legal hammer.